I am not a runner. In fact, the only time you would likely ever see me running is in the woods, being chased by a Grizzly. Running is not my idea of fun, but I do enjoy a good walk. And, that's precisely who 'fun runs' are geared towards. 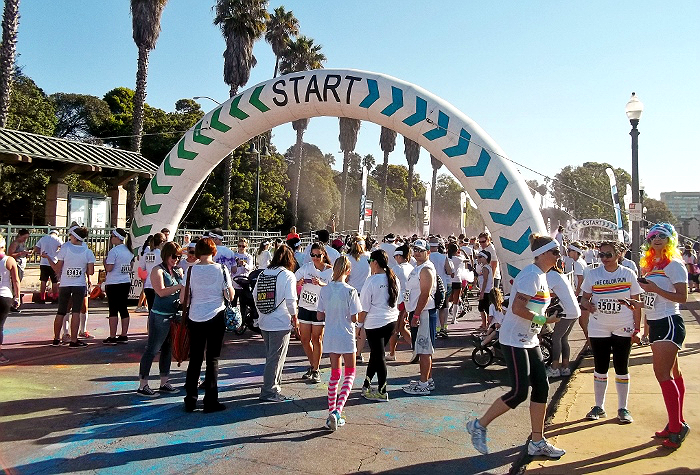 A fun run, contrary to the title, is more of a walking event specifically designed to bring people together to have fun. There are countless types of fun runs that have popped up over the years; from Zombie Survivial runs to Mud Runs, and even Color Runs, in which people are splattered with colored corn starch at various stations along the way. These runs are often about 5k, or 3 miles in non-runner speak, and have absolutely no prizes for placing. They require paid entrance, which includes promotional items, and covers the host city's fees for law enforcement and route designation. It seems color runs are widely picking up popularity, with near a dozen different organized events (from Color Me Rad, Run Or Dye, to Color Smacked!) across the nation, with over 300 individual events within these organizations throughout the year. 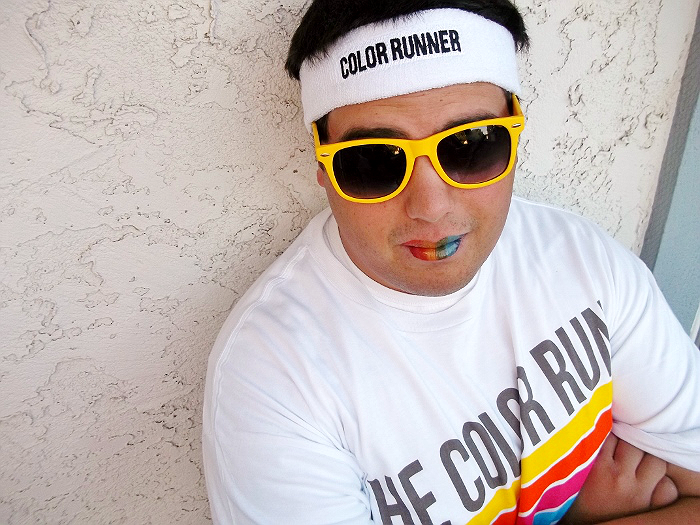 You may recall I blogged about the original Color Run, a few months back, when I first considered entry. The very concept made me simply giddy, so I put out a basic call out on my personal Facebook page for any nearby friends or family who may be interested in tackling this unique experience with me. The response was immediate and as enthusiastic as myself; we had a team in no time.The event soon turned into an anxious milestone we all would talk about for the following months as we gathered our 'outfits' and planned our shenanigans for the big day. Ever since I was a little girl, colorful things have brought me happiness. As if it doesn't shine through enough in my style and personality, it has certainly come through in my hair. 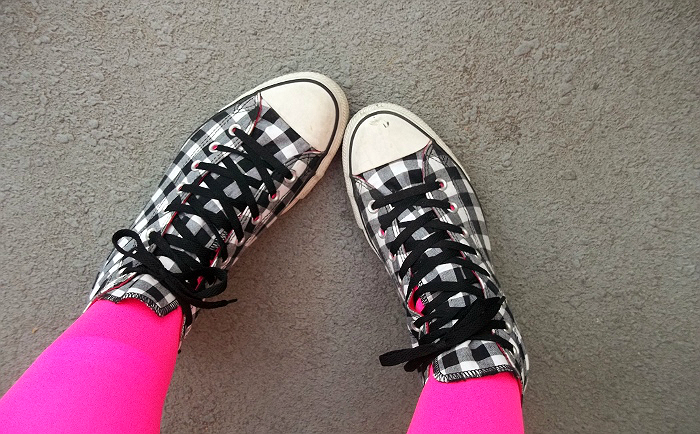 Ironically, planning your outfit for The Color Run isn't as colorful as one might think. The key to becoming a human canvas is to cover yourself in as much white, preferably cotton, as possible. Many people end up preserving their outfits in frames (a vinegar spritz followed by a good iron is suggested), for posterity purposes after. 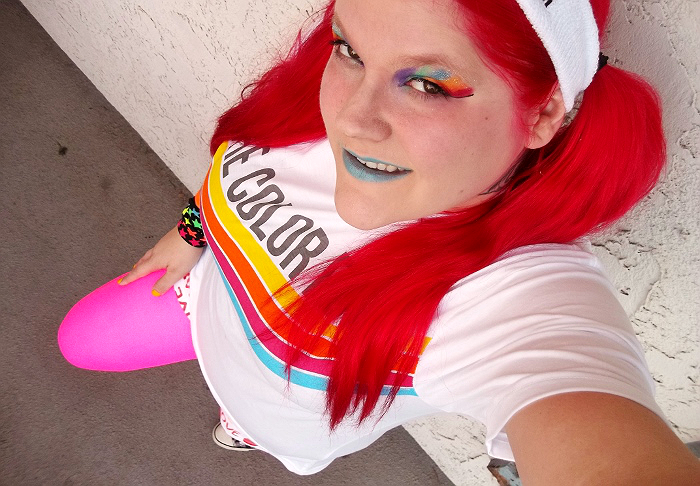 Of course, accessorizing is the quickest way to add some character to your outfit, and big events like The Color Run will be happy to sell you their branded merchandise (including sunglasses, tutus, and socks), for a modest fee. If you plan on buying directly from the event (online prior, or on the big day) be sure to find out if there is any charity profit for sold merchandise. 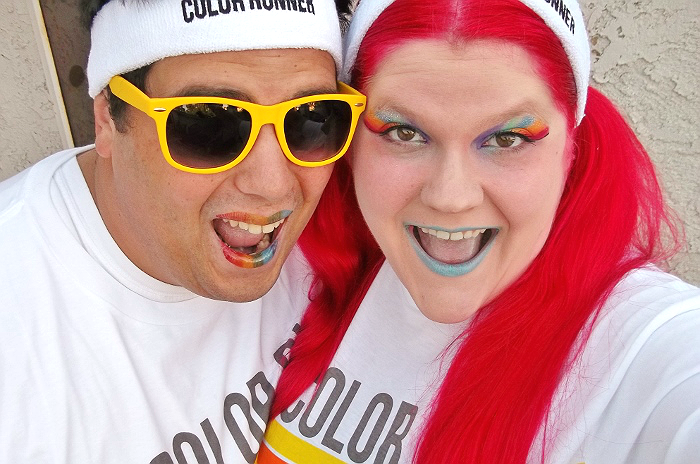 The Color Run donates a portion of their merchandise sales directly to a charity organization in the event's town. But I don't recommend spending hundreds of dollars on 'official merchandise.' For your entry fee with the Color Run (which often begins around $25-35 for early entry), you will get an event t-shirt, headband, official runner number, wristband, and temporary tattoos to commemorate your participation. We registered early, and had 3 months to prepare our 'outfits' and kept an eye out at Hot Topic, Spencers, and Claire's clearance racks for neon glasses, tights, and shorts that would suit our purposes much cheaper. 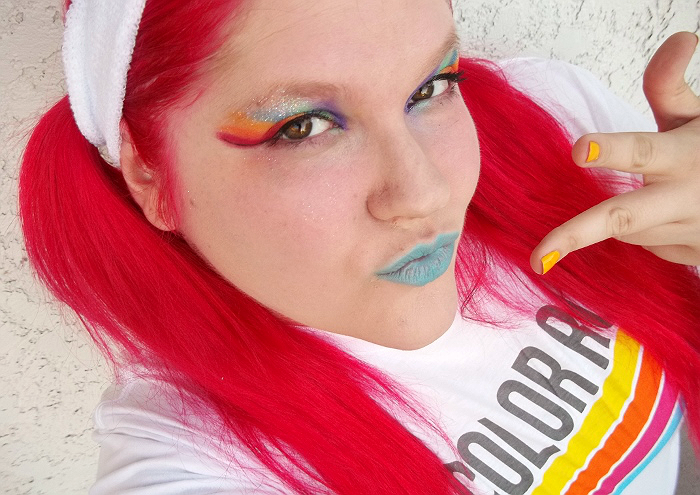 You may also want to pick up some colored sun block, face paint, and bright cosmetics (eyeshadow, lipstick, nail polish, etc) to add some temporary color for the big day. Sabrina (11) and Jay both wore temporary lip tattoos that gave them brilliant rainbow lips for the big day. Most fun run events, like The Color Run, have no bag check, but permit backpacks and strollers for participants. We chose to bring a backpack stocked with water (though there is a halfway water station), and our wallets and cameras. Keep in mind that there will be people literally spraying you with colored corn starch (powder) at the color stations, and even throwing it at you in crowds, so any electronic equipment should be brought at your own risk, or protected with the appropriate photo bags. Also keep in mind that these giant clouds of corn starch color stations are a bit overwhelming for those with sensitive noses and lungs (though all coloring is food grade), and bring a paper mouth mask or handkerchief if desired. Remember, you will be covered in color that is generally loose, and might rub off, so bring a change of clothes and/or towels for when you make it back to the car. Sweating and any moisture will make the color seep into particles and skin, and may temporarily stain dyed hair- so alert your boss in advance and pick up a bar of Lava Soap (found cheap near the bar soaps at your local grocery chain) to scrub the color out of your skin. Not only will the color seep through several layers and most certainly color skin beneath, but Lava soap has a great exfoliating texture that will lift the color off with much less scrubbing than body washes and traditional soaps. 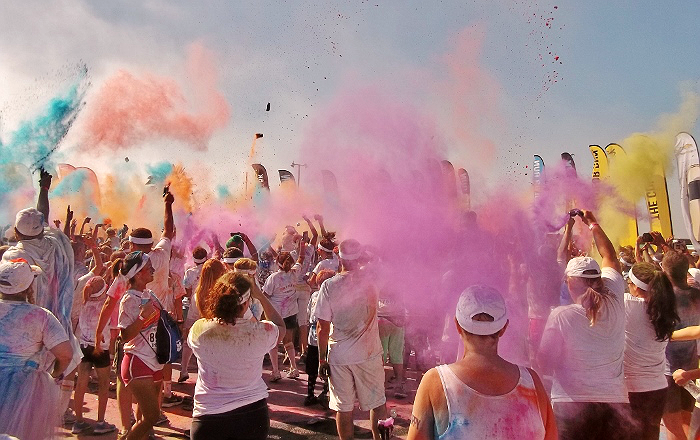 Are you ready for your first Color Run? Then stay tuned, because I'll e back with 2 more posts to walk you through our teams experience with a mountain of fun and colorful photos from the event! That looks like fun. I have never seen those around here but my son did do the Spartan race this summer. What? No After photos? Love your before look, though! My daughter just did one of these recently. She loved it! I ran this today! Best time ever! Lovin' the eyeshadow! Looks like a fun time!!! I never heard of this run but it sure looks like you had fun! oh my gosh I totally love your picks! They're so crazy cute!Outlook Support now your problem can easily resolve by this website.